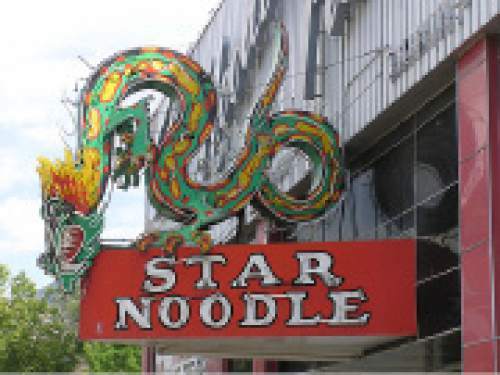 Whatever happened to ... the Star Noodle neon dragon? Historic Ogden • The Star Noodle Parlor is no more, but new businesses to move in. 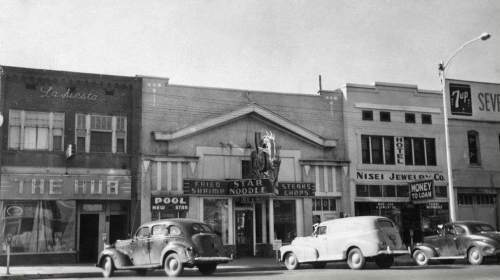 Courtesy photo | The Star Noodle dragon sign in Ogden in the early 1950s. Courtesy photo | The former Star Noodle dragon sign, which stood watch over 25th Street in Ogden for more than five decades, was taken down in 2008 for renovation by YESCO. It was built by YESCO in the 1950s with 250 feet of neon and 58 smaller lights. The entire sign was sanded down to the original structure and refurbished. Courtesy photo The Star Noodle Dragon in Ogden in the 1980s. 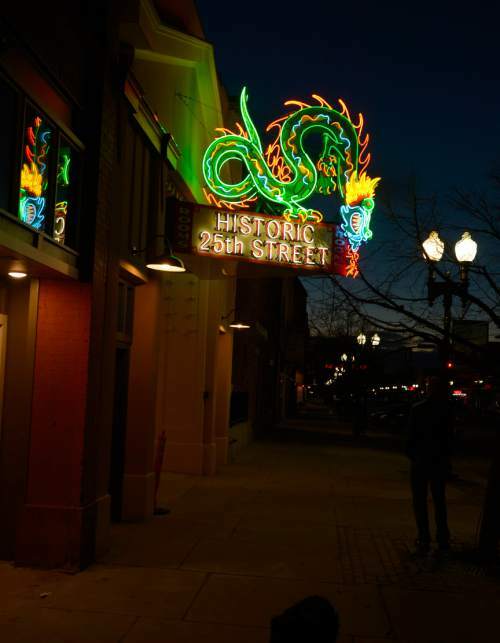 Leah Hogsten | The Salt Lake Tribune The neon dragon sign that hung at the Star Noodle restaurant in Ogden for decades has been refurbished and was re-hung on Friday. The former Star Noodle dragon sign stood watch over 25th Street in Ogden for more than five decades. In 2008, the sign was taken down so it could be renovated. The sign is the original design built by YESCO in the 1950s with 250 feet of neon and 58 smaller lights. YESCO was contracted to refurbish the sign and the entire structure was completely sanded down to the original structure. Courtesy photo | The former Star Noodle dragon sign, which stood watch over 25th Street in Ogden for more than five decades, was taken down in 2008 for renovation by YESCO. It was built by YESCO in the 1950s with 250 feet of neon and 58 smaller lights. The entire sign was sanded down to the original structure and refurbished. 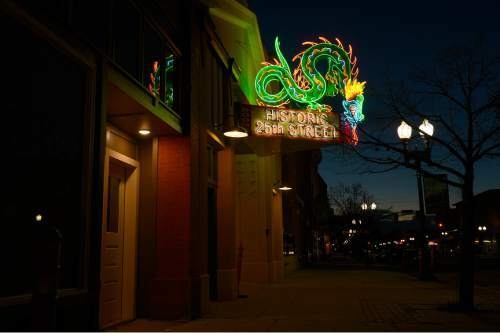 Leah Hogsten | The Salt Lake Tribune The neon dragon sign that hung at the Star Noodle restaurant in Ogden for decades has been refurbished and was re-hung on Friday. The former Star Noodle dragon sign stood watch over 25th Street in Ogden for more than five decades. In 2008, the sign was taken down for the purpose of renovation. The sign is the original design built by YESCO in the 1950s with 250 feet of neon and 58 smaller lights. YESCO was contracted to refurbish the sign and the entire structure was completely sanded down to the original structure. 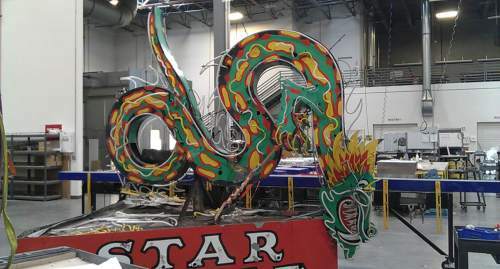 Leah Hogsten | The Salt Lake Tribune The neon dragon sign that hung at the Star Noodle restaurant in Ogden for decades has been refurbished and was re-hung on Friday. The former Star Noodle dragon sign stood watch over 25th Street in Ogden, Utah, for more than five decades. In 2008, the sign was taken down for the purpose of renovation. The sign is the original design built by YESCO in the 1950s with 250 feet of neon and 58 smaller lights. YESCO was contracted to refurbish the sign and the entire structure was completely sanded down to the original structure. Editor&apos;s note • In this regular series, The Tribune explores the once-favorite places of Utahns, from restaurants to recreation to retail. If you have a spot you&apos;d like us to explore, email whateverhappenedto@sltrib.com with your ideas. 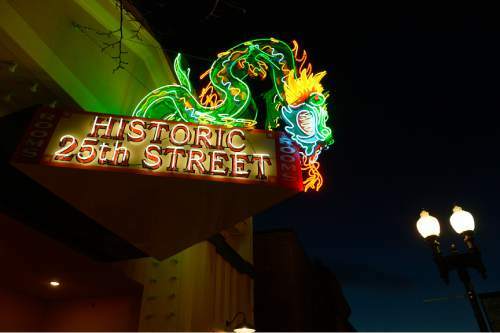 The dragon neon sign, an icon of a time when noodle parlors and other businesses owned by Japanese-Americans dominated a stretch of Ogden&apos;s 25th Street, is finally home again. But for a while there, Greg Montgomery, Ogden&apos;s city planner, felt like he was in a "Where&apos;s Waldo?" book. People would call to say they saw the dragon in an outdoor lot, but then it was gone. Next, a caller would say the dragon sign was in an obscure building. "Instead of &apos;Where&apos;s Waldo?&apos; it was where&apos;s the dragon?" Montgomery said. "People were watching out for it." By Friday, though, the refurbished neon sign had been rehung and relit on the 25th Street building where for nearly 60 years it advertised the Star Noodle Parlor. The building has been restored by its owner, Fischer Regan Enterprises, and soon will have a restaurant  Salt Lake City&apos;s Pig & a Jelly Jar is expanding  and a tech company and other tenants, says Thaine Fischer, managing partner. Five of the six spaces are leased, and construction on tenant improvements will begin soon. He plans to light the dragon every evening at dusk. Fischer said he took down the dragon sign soon after buying the building from the Star Noodle Parlor owners, the Ryujin family, in 2007. The sign had to be removed so the 1970s-era plastic false front of the building could be removed and the original facade revealed. The dragon was stored outside for some time, but it had been outside since 1948 without rust or other serious damage, Fischer said. He had expected to renovate the building and reinstall the dragon sign within a year, but the economy tanked in 2008 and it took years for the market to ripen for renovation and leasing, Fischer said. YESCO, a Salt Lake City company that was founded in Ogden in 1920, built the original neon sign, and its workers did a complete tear-down restoration. "Removing the layers of metal that had been added over the years was like stepping back in time. On the innermost layers I was able to experience 1940s sign painting techniques and fabrication technologies," Steve White, the project manager for YESCO, said in a city news release. "Everything was done by hand in those days. No plastic and silicone here." Montgomery said the building is on the National Register of Historic Places by virtue of its location; all of the once-bawdy 25th Street from Grant Avenue to Wall Avenue is a historical district. But the sign itself is more historically important. It symbolizes two things, he said. The Japanese-American community owned more than 40 businesses along a block-and-a-half of 25th Street in the early decades of the 20th century, when Ogden was an important stop for troop trains. "They were a vital part of that community. They were the majority owners on that part of 25th," says Montgomery, who ticked off four noodle parlors now long gone. The dragon sign is also historically important as an example of neon at its height in popularity. "People still relate to that sign. It brings back memories. Certain signs are landmarks, and that is one of them." The building where the Ryujin family moved their 4-year-old Star Noodle Parlor in 1948 was previously a theater. Built in 1912, it hosted both live theater and movies, and is called the Rex Theater building in the national register. In a YouTube video Fischer made while marketing the property, he takes viewers on a tour, showing evidence of the once-sloped floor for theater seating and the boxes from where the movies were projected. In the building&apos;s basement, he points out a tunnel, apparently one of the famed tunnels that underlie Ogden&apos;s downtown.